Don’t Rent! Get the Mini Stall Tent for your Start-up. 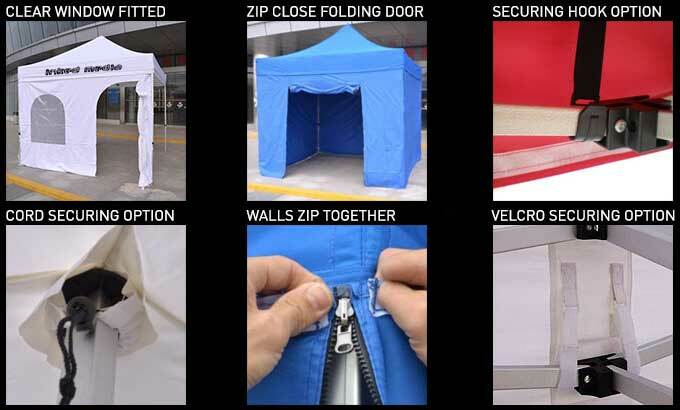 A “2X2 Mini Stall tent” can be easily setup in a matter of just 5 minutes. Its luxuriously anodized aluminium framework provides strength without the unit being too heavy to transport from one location to another. If you are looking to save money in promoting your new business idea, invest in this Mini Tent which can house all your laptops/connecting devices, pamphlets, boxes etc conveniently. Oh, and also the staff you are working with! Got a Unique Idea for an engineering/science/resource project? Need a safe place to display your system. Ideal for school/college fun and fare or marketing stalls. 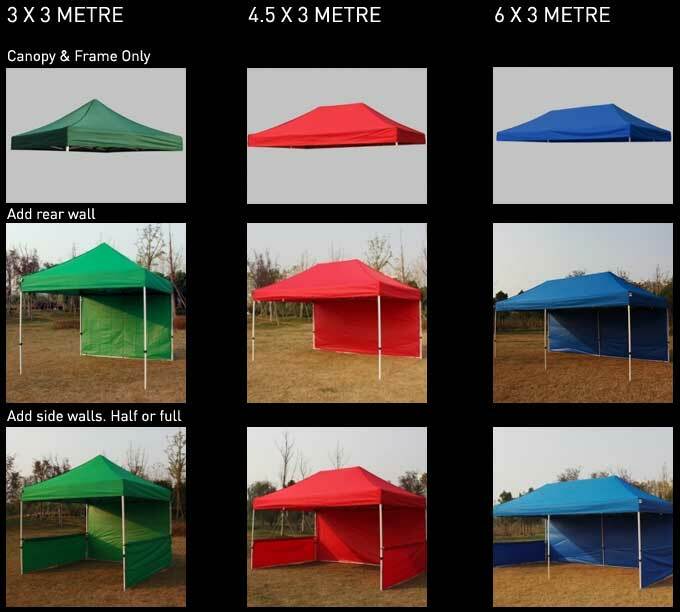 600D polyester, oxford, and canvas coated PVC or PU, made of UV proof, waterproof or fire retardant material, options are very available in the case of these Mini Stall Tent’s. It is extremely spacious, providing longer lasting marquee display with increased safety for people walking in and out of your tent. The Mini Stall Tent has the options of cord securing as well as walls zip together where the framework is made up with non-breakable HQ nylon plastic accessories & joints, heavy duty reinforced ribs. We all love travelling, especially those trekking, hiking, skiing, fishing, bungee jumping, boating trips and the list just goes on. How awesome would it be to just carry along a tent that requires no tools for assembling the entire unit as it just pops up in less than 5 minutes? These 2X2 Mini Stall Tent come with clear window fitted, zipped close folding door, Velcro securing options and securing hook options in those moments of staying at a campsite or even jungle. Each leg also features a rotating cam lock to snap the frame into the desired height as per the terrains or physical nature allows. The Mini Stall Tent can have sidewalls (half/full) as well as rear walls. Hence, the tents can be well used as display units where shoppers can pass by and “window shop” through your selling items. Also the design gives good room and space for interaction with your customers as well as more business growth. The promotional marquee displays are made from high tensile framework and are covered in 500d flame retardant, water resistant UV stable polyester. Which is fully CMYK printed in your branding. The unique design of these locks on the 2X2 Mini Stall tent eliminates sore fingers because they can be turned rather than pulled to release the structure. Every tent canopy includes a carrying bag to house the aluminium finish frame and components during transportation. These weather proof, full colour, printed outdoor marquees are ideal for outdoor events where you need weather proof cover which also conveys your company branding. 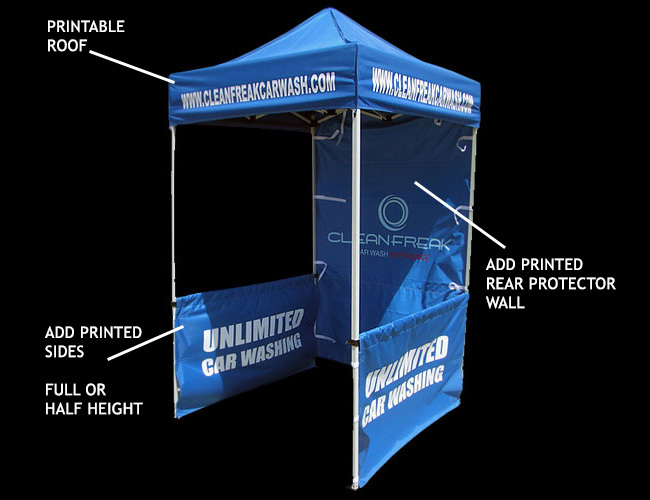 A Mini Stall Tent is the new revolution in marketing strategies as well as sales and customer desk support systems. In a world where how you advertise and how you present your brand matters the most, owning this miraculous device could be a boon on the run anywhere.